Did you know that the symptoms of oral cancer frequently go unnoticed or overlooked? Often, cancerous growths in the oral cavities can resemble benign lesions in the mouth, such as an abscess or canker sore. As a result, many individuals afflicted with the disease have no knowledge of their condition until the cancer has progressed to its later stages. Join Dr. Cathy Santone and the team at Encinitas Cosmetic Dentistry in the fight against oral cancer by undergoing a screening as part of your routine dental visit! For the entire month of April, Dr. Santone is donating 100% of the proceeds collected from the screening fee ($35) to the Oral Cancer Foundation. 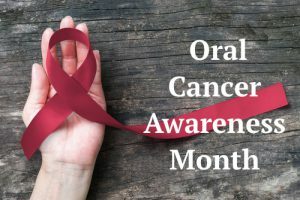 Given that approximately 132 Americans are diagnosed with a type of oral cancer every day, a screening can be a critical measure to detect the disease during its most treatable stages. An oral cancer evaluation can easily be incorporated into your scheduled check-up or dental cleaning. The process is simple, easy, and invaluable to the identification of tumors or pre-cancerous cells early on. Dr. Santone employs state-of-the-art VELscope® Vx Oral Cancer Screening technology to examine patients, which is a non-invasive tool that uses a specialized blue light to detect warning signs that may not be visible to the naked eye. This painless evaluation typically takes less than two minutes and can be vital to the exposure of dangerous growths and subsequent timely treatment—a combination that, according to the Oral Cancer Foundation, is the most effective means of addressing oral cancer. We encourage all patients, particularly individuals who smoke, drink alcohol, use tobacco products, or have been exposed to HPV, to undergo a screening in order to remain proactive about their health. For any questions you may have about getting an oral cancer screening, or to schedule a consultation, please contact our team today.